After writing my giant guide on all my c-section postpartum essentials, I thought it would be great to share with you all of my postpartum fashion essentials. Obviously with 4 kiddos running around, I don’t have much time to get out of the house but when I do I like to look and feel like a normal person instead of an exhausted momma of a newborn (plus 3 more). Getting dressed the first few weeks, or even months, after giving birth is an interesting time. You have this new body that just went through 9 months of growing and birthing a new baby and now you’re stuck trying to figure out how to dress it. 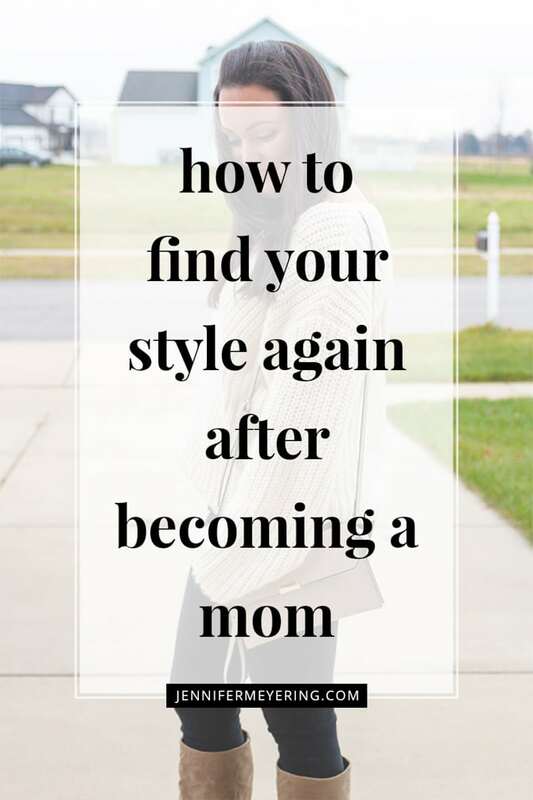 You’re definitely not feeling like wearing your maternity clothes anymore… or at least I wasn’t… and your regular clothes won’t fit your new postpartum body. Let’s not even try and squeeze ourselves into them because they will just make you look and feel like the Michelin man. Or at least they did for me. Unfortunately, for most, that pregnancy weight doesn’t just fall off right after you have the baby and you usually still have a belly that makes you look like you’re about 6 months pregnant. It definitely takes a while for you to get back to where you were pre-baby and, therefore, most of your clothes won’t fit right away or even fit the same way again. Give yourself grace. It took 9 months to grow the baby and it will take at least that to get close to where you were before or where you might want to be. However, instead of being upset that you’re not bouncing right back into your pre-pregnancy jeans, accept it and adapt to dress it accordingly to make yourself feel great. Honestly, most days you won’t even feel like getting dressed because you are low on sleep, desperately need a shower, and just feel like “blah.” However, after the first couple weeks of baby fog wear off, it starts to feel good to get up, get dressed and start to feel normal and like yourself again. Even if getting out of the house means just a trip to grab some coffee. So here’s my giant guide of tips for easy postpartum fashion. Because everything is better when it’s easy, right? For the first 6 weeks after giving birth, I live in my belly band and postpartum girdle. It just makes me feel so much better. It pulls everything in and makes my belly not feel so jiggly and give my back some amazing support since my ab muscles are pretty much non-existent. Most of them made now-days are made so you can wear them under pants and tops and are virtually undetectable. I actually wore mine all day, every day except at night while I was sleeping. No one besides my husband even knew I was wearing one. They would all just point out how flat my stomach looked after giving birth. Loose, flowy tops are your friend. They are great for nursing (if you’re able) and they also hide the postpartum belly while still making you look chic and put together. Button-down, chambray, and plaid or flannel tops are some of my favorites because they are usually super comfy, flowy, and make me feel a little more put together than just a regular t-shirt. Tunic tops are another great option because if you’re like me at all then you already live in leggings and tunic tops… why stop now that you’ve just had a baby? Tunics tend to be a bit oversized already and are long enough to cover any parts that you’re uncomfortable with. See point above about already living in leggings and tunic tops… haha. But seriously, I lived in leggings when I was pregnant. I am not a fan of maternity jeans and leggings are just way more comfortable. After baby, I usually just trade my maternity leggings for some high-waist leggings to keep the belly sucked in. Plus, a simple pair of black leggings can be paired with just about anything and you’ll look and feel put together. Faux leather leggings are a super fun option too and they definitely add a little “wow” factor to any outfit. Plus you can dress them up or down depending on what top and shoes you pair with them. Luckily, currently, high-waist denim is everything. Back when I had my first baby all I could find was low-rise everything and so I didn’t end up wearing jeans again for months. And even then it wasn’t my favorite. Now, with all the changes in denim over the past 12 years and how comfortable they are, I could not wait to get back into a regular pair of jeans again. Yes, I had to go and buy a new pair because my old one did not fit but TJ Maxx has a ton of great jeans for such cheap prices that you won’t feel bad spending $20-30 on a pair of great jeans that will probably only fit for a few short months. When looking for high-waist jeans, look for some that have a rise of at least 9-10 inches. Anything that hits right around the belly button is a great choice. Also, look for something that has a great stretch. Stretch is important so it holds you in better and you can fit into your jeans for a little longer period of time while your belly is still shrinking. Wraps, kimonos, and cardigans are all great options for layering after baby. They keep you warm in a cold restaurant, help you nurse more discretely, and can cover any muffin top you may have from the pants you’re wearing. I live in maxi dresses in the summer time. I just love how flowy they are and are such an effortless way to look put together without much work. Any dress that isn’t form fitting is great for post-baby. I definitely love my heels but with 3 other kids and a newborn, heels just seem impractical most times. So instead I grab a cute pair of slide on sneakers for going out instead. No matter where I go or what I’m doing, I always feel a little more put together with a little makeup on my face. Of course, right after having a new baby there isn’t much time to put on a full face so I usually just swipe on my CC cream, concealer, a paint pot, mascara, and tinted chap stick. Less than 5 minutes and I’m out the door and ready to go. 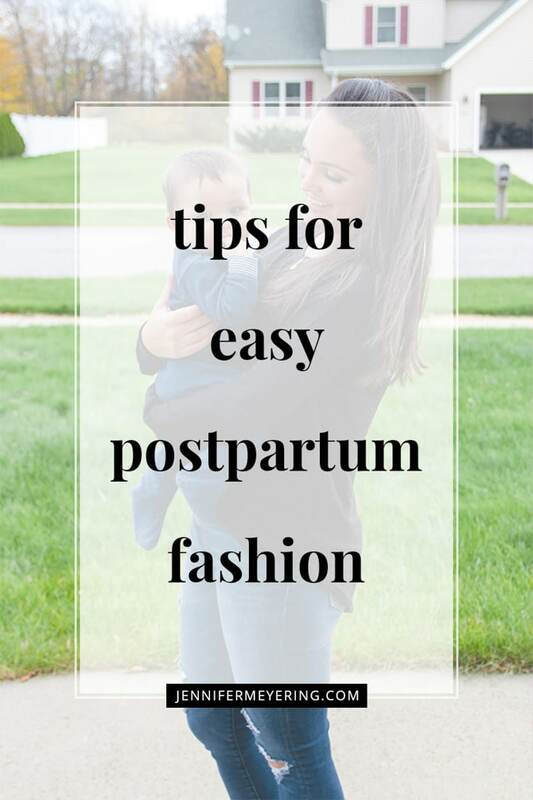 So there you have it… all my tips and tricks for easy postpartum fashion! It doesn’t have to be hard to look and feel put together after baby. With just a few simple tweaks to your wardrobe, you’ll be feeling great in no time. Do you have any tips that I didn’t mention here? Let me know in the comments below!